Twelve years have passed since the events of Frank Herbert’s Dune, years of bloody war for universal conquest by Muad’Dib’s Fremen crusaders. The former Emperor’s House Corrino family members now live in exile on the planet Salusa Secundus. But while his youngest daughter Irulan is married to Paul, his oldest, Wensicia, is plotting her family’s revenge. Back on Arakkis, Paul’s now adult sister, Alia, rules his empire with an iron fist, even as his lover, Chani, will soon give birth to Paul’s heirs. But those children, Leto II and Ghanima, will not be what anyone expects. Though Greg Yaitanes replaced John Harrison as director for Children of Dune, Harrison actually wrote both miniseries, which helps the dramatic continuity tremendously. For Children of Dune, Harrison combined the stories of Herbert’s first two sequel novels, Dune Messiah and Children of Dune, into a single narrative and broke it into three parts to match the first series. In some ways, it’s actually a better dramatic experience. Alice Kreig replaces Saskia Reeves as Lady Jessica and brings real gravitas to the character as she matches wits with new cast member Susan Sarandon, playing the villainous Princess Wensicia. Alec Newman, Barbora Kodetová, Julie Cox, and Ian McNeice all reprise their roles as Paul, Chani, Irulan, and the Baron Harkonnen, respectively, but two more new cast members stand out too: James McAvoy and Jessica Brooks as Paul and Chani’s children, Leto and Ghanima. Daniele Amavia is also in good form here as the now adult Alia. Meanwhile, Steven Berkoff replaces Uwe Ochsenknecht as Stilgar and Edward Atterton replaces James Watson as Duncan Idaho (as the original actors were unavailable). Composer Brian Tyler returns to add a fine score, music from which has been reused in many other trailers and productions since. 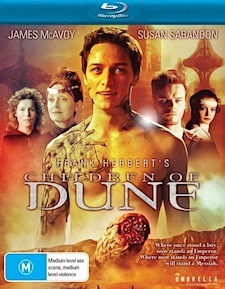 As was the case with the original Frank Herbert’s Dune miniseries (see our review of Alive AG’s Blu-ray release here), Children of Dune has been available in a couple of different Blu-ray versions in recent years, both of which were problematic for US fans. Elephant Films released a single-disc BD in France in 2008 that was region free, but suffered from the dreaded 4% PAL audio speed-up. Universum Film GmbH followed this in 2013 with a 2-disc BD in Germany that was the correct 24p, but Region B locked. Thankfully, the Australian distributor Umbrella Entertainment has now come to the rescue with a single-disc BD edition (released in late 2017) that’s both 24p and region free, so this is definitely the one that US fans will want to get their hands on. Unlike the original Dune miniseries, Children of Dune was shot digitally using a Sony 24p HD camera with modifications by Panavision. The CG visual effects were rendered in different resolutions (1080, 720, and some SD), depending on whether they were foreground, midground, or background elements, and final compositing was done in 2K. What all of that means is that Blu-ray is as good as it gets for this production. It’s presented here in 1080p HD at the full 1.78:1 broadcast aspect ratio. Detail in live action is very good overall, with perhaps a bit of edge enhancement baked in, though it’s quite not up to current standards. Colors are rich and vibrant, however. 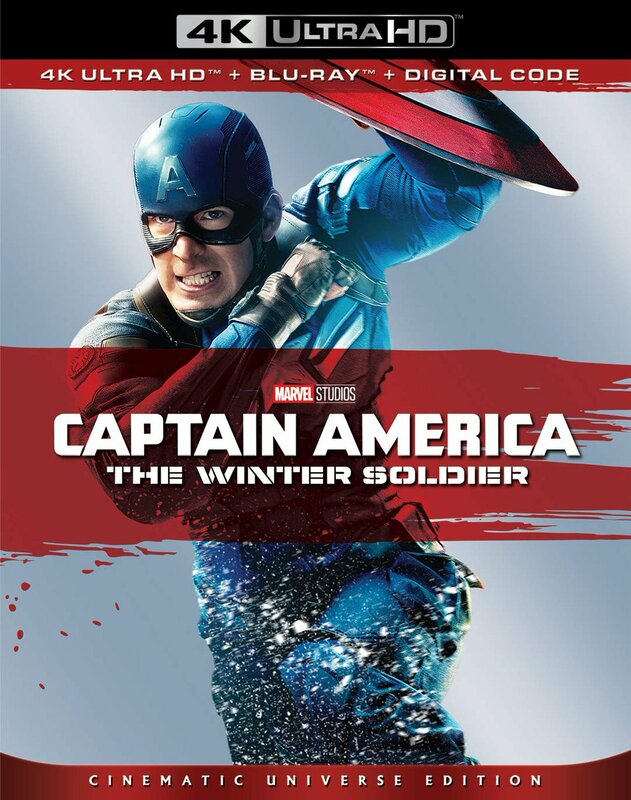 All things considered, it’s a nice image and definitely superior to the previous DVD release. 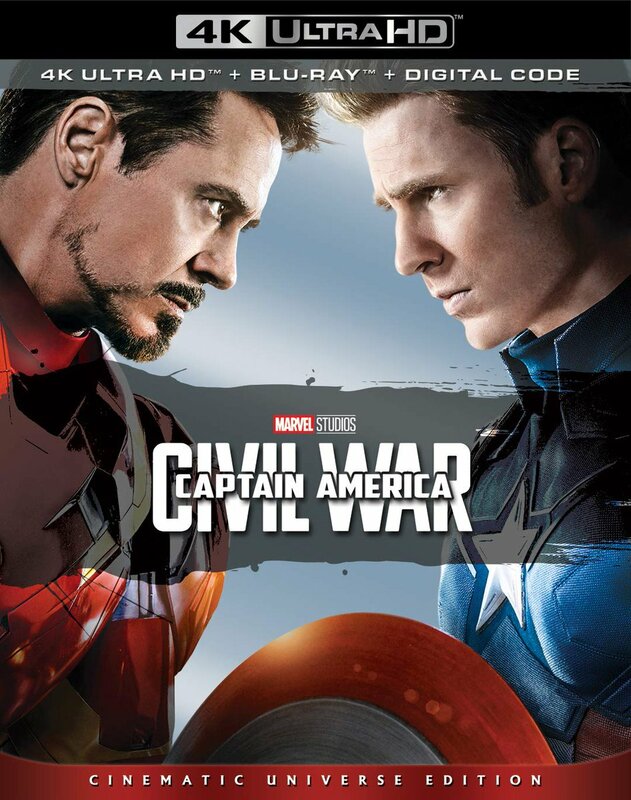 Audio is available here in English 5.1 DTS-HD Master Audio (no subtitles are included). The mix features a smooth, rich, and wide soundstage, with excellent clarity and ambience, lightly active directional play in the surrounds, and good bass. Like the earlier miniseries before it, Frank Herbert’s Children of Dune was a tremendous success for the Sci-Fi Channel, drawing both good critical reviews and strong ratings. For those of you who enjoy it, don’t hesitate to pick up Umbrella Entertainment’s Blu-ray release. It’s region free and affordably priced; you’ll be happy to add it to your collection. Be sure to pair it with Alive AG’s region free/24p Blu-ray of Frank Herbert’s Dune to enjoy the complete miniseries experience. Both are recommended.